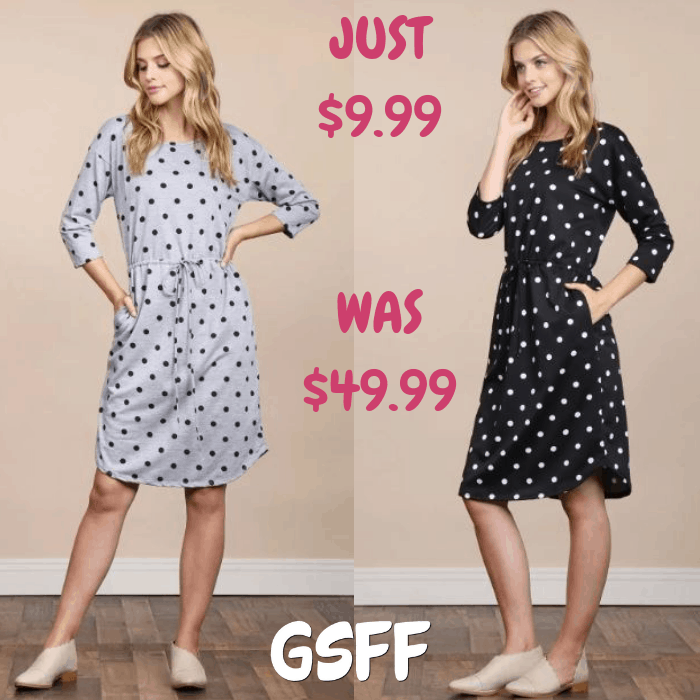 Polka Dot Dress Just $9.99! Down From $50! You are here: Home / Great Deals / Polka Dot Dress Just $9.99! Down From $50! This deal expires on December 12! Head over to Jane to score this Polka Dot Dress for only $9.99 down from $49.99! Shipping is $3.99 for the first item and $1.99 for each additional item. Style yourself a look that’s perfectly suited for brunches, date nights, and everything in between with this classic polka dot print dress with two side pockets. Made of high qualify french terry material, you’ll love how the flowy silhouette makes for a comfy fit, and the tie waistline subtly cinches your figure for a flattering fit. Keep things sweet and simple by wearing the dress with slide-on mules.